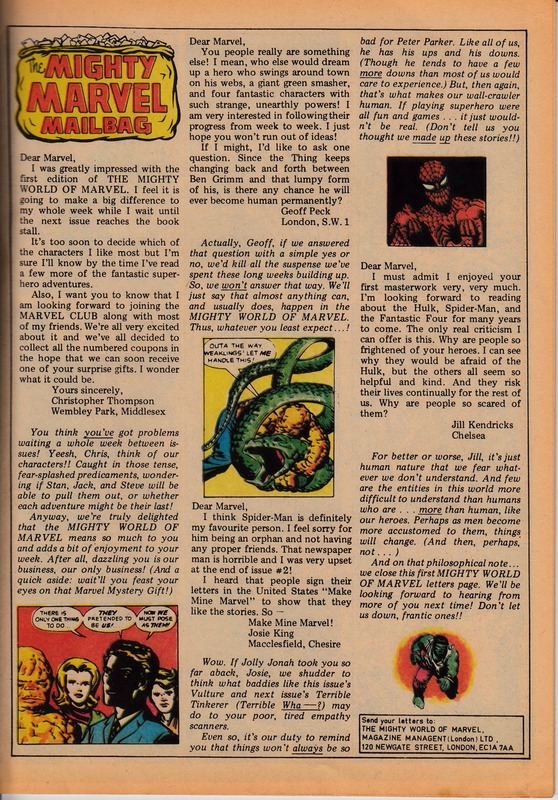 1972: THE MIGHTY WORLD OF MARVEL: THE BIRTH OF MARVEL UK. This is it true believers! The Mighty Marvel UK age starts here! 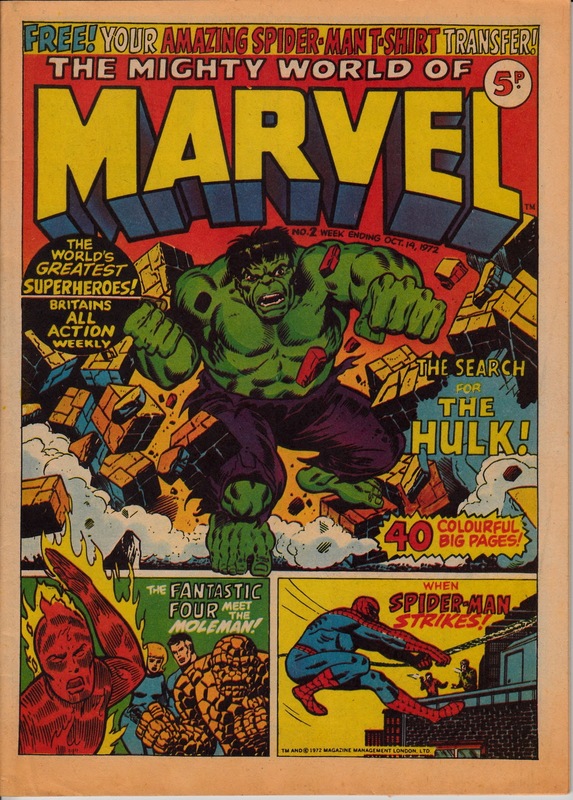 After a decade of allowing others (Alan Class, Oldham's Alf and Bart and IPC ) to publish their strips in the UK, Marvel open their own UK operation to repackage their American strips! 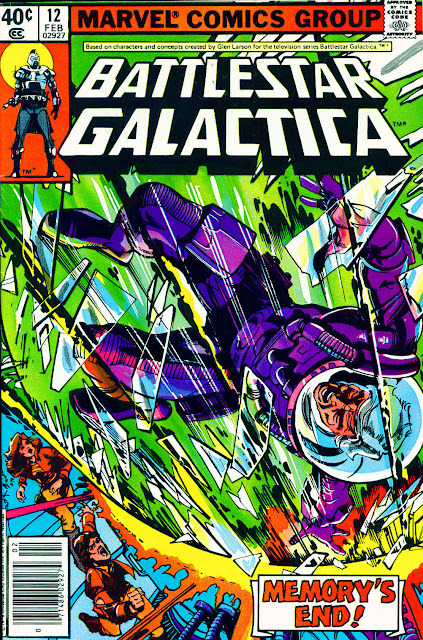 The format was 40 newsprint-type pages, with 8 in colour. 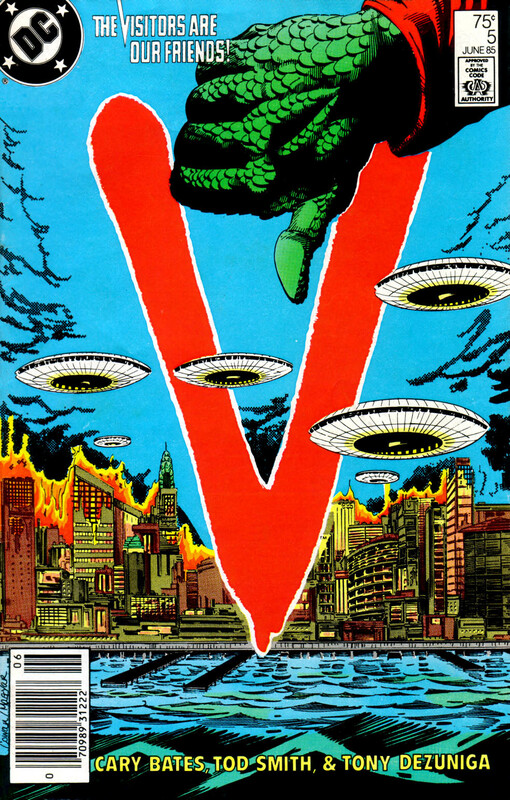 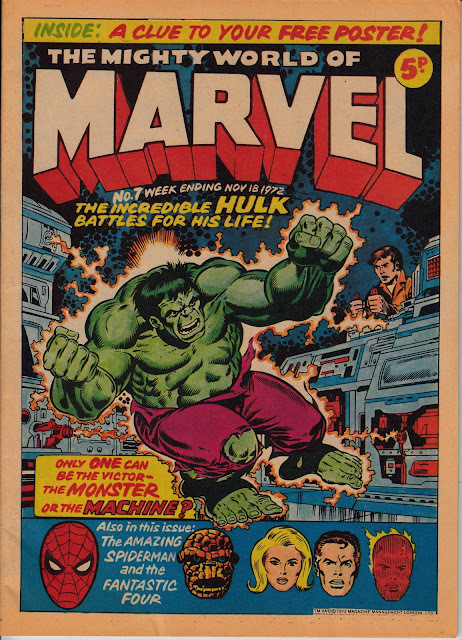 Others were printed with one other colour, usually green to the benefit of the Hulk strip (and detriment of the others). Glossy covers (and entirely black and white interiors) were added after a year. 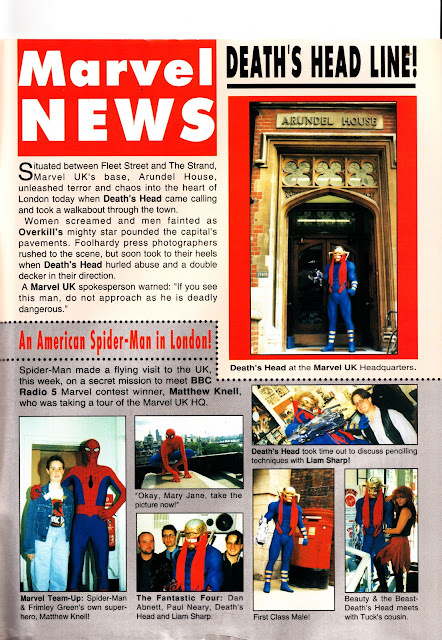 Despite having a UK office in London's Newgate Street, the majority of the packaging and production was handled by the New York office, leaving London to handle editorial, administration, advertising and distribution. Marvel UK remained a firmly US affair until Dez Skinn took the helm in 1978. 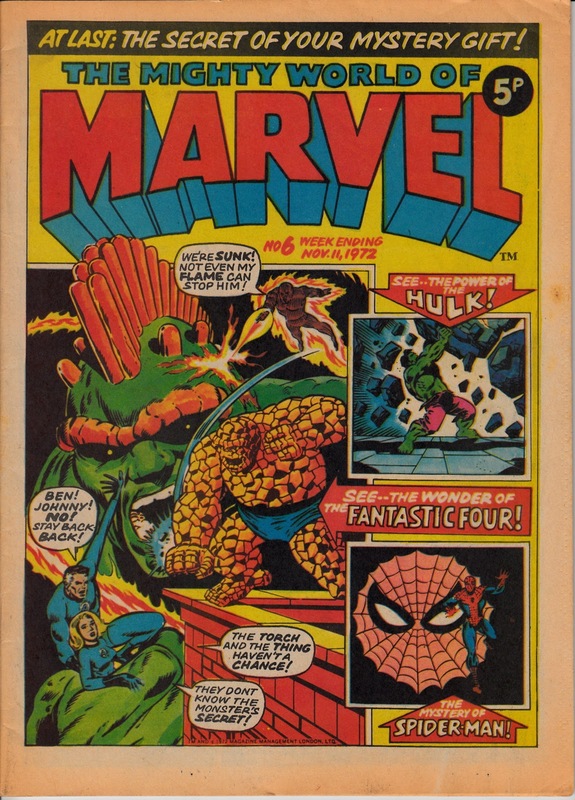 Their first launch was THE MIGHTY WORLD OF MARVEL (MWOM), a weekly anthology of SPIDER-MAN, THE HULK and THE FANTASTIC FOUR, all beginning with their respective US first issues. 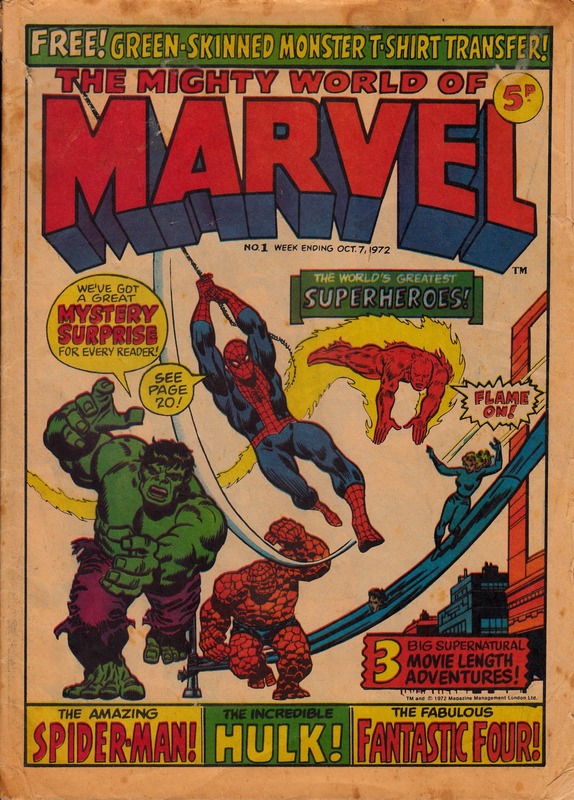 The line-up didn't last long, Spidey spun-off into his own weekly from February 1973 leaving a gap for DAREDEVIL. THE INCREDIBLE HULK remained a constant throughout MWOM's life, supported by an ever-changing line-up. Expansions and (more often) contractions in the Marvel UK line added, at various times, THE AVENGERS (and CONAN THE BARBARIAN), DRACULA LIVES!, PLANET OF THE APES and FURY. 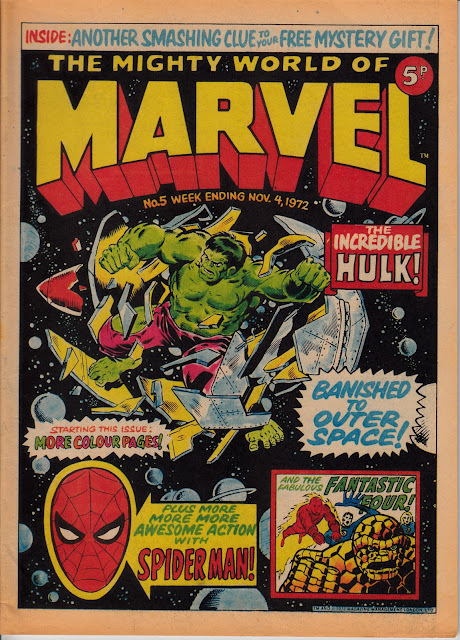 An increasingly lacklustre MWOM limped on to January 1979, bolstered by the UK premiere of the INCREDIBLE HULK TV show, before being rebooted by Skinn in January 1979 as MARVEL COMIC from issue 333. The reworked anthology wasn't a success and ended after issue 352 (cover dated 25 July 1979), merging with SPIDER-MAN COMIC while simultaneously reemerging as MARVEL SUPERHEROES: A MARVEL MONTHLY. 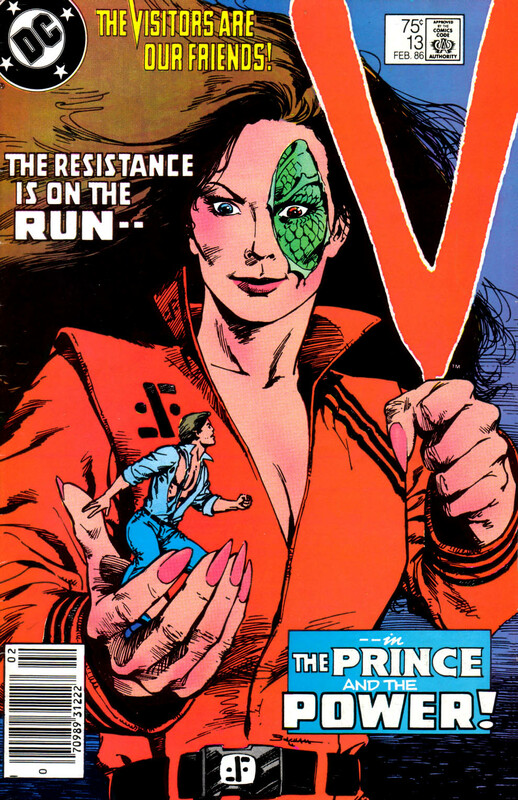 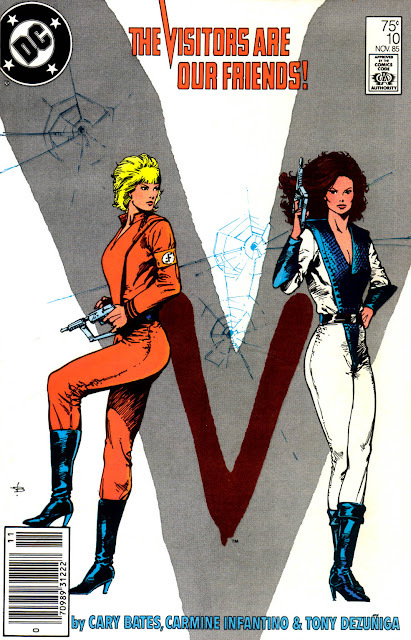 The MWOM brand was revived in June 1983 for Marvel UK's new monthly, briefly home to Captain Britain (after it absorbed THE DAREDEVILS), before ending after 17 issues (merging with THE SAVAGE SWORD OF CONAN). Marvel licensee Panini revived the name again for one of its COLLECTORS' EDITION anthologies in February 2003. But we'll get to those. 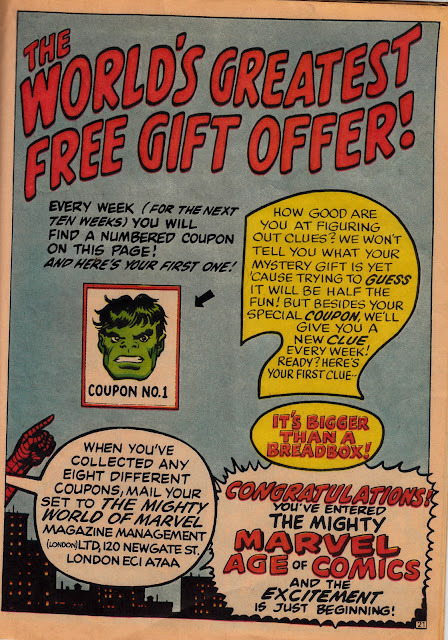 FREE GIFT: Hulk iron-on t-shirt transfer. 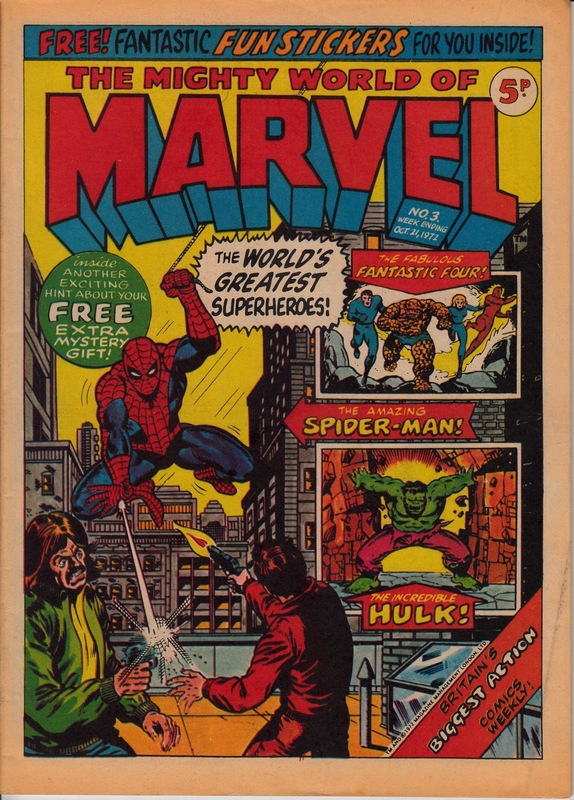 FREE GIFT: Spider-man iron-on t-shirt transfer. The first Marvel UK letters page. 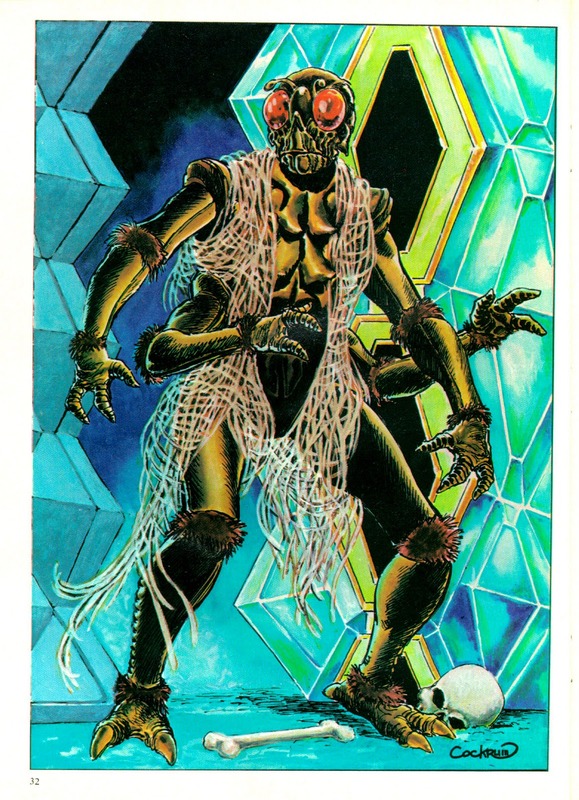 First letter published: Christopher Thompson, Wembley Park, Middlesex. *It's a mail-away premium poster! 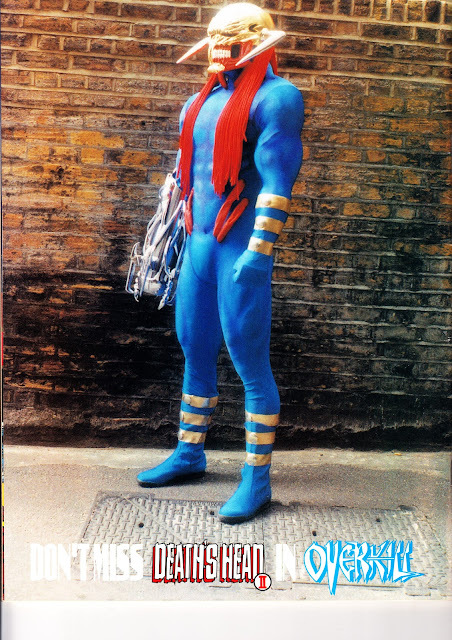 To celebrate Marvel UK's 21st birthday, and the boom years for the Temple-based UK operation, the company had a float in the 1993 London Lord Mayor's Show. 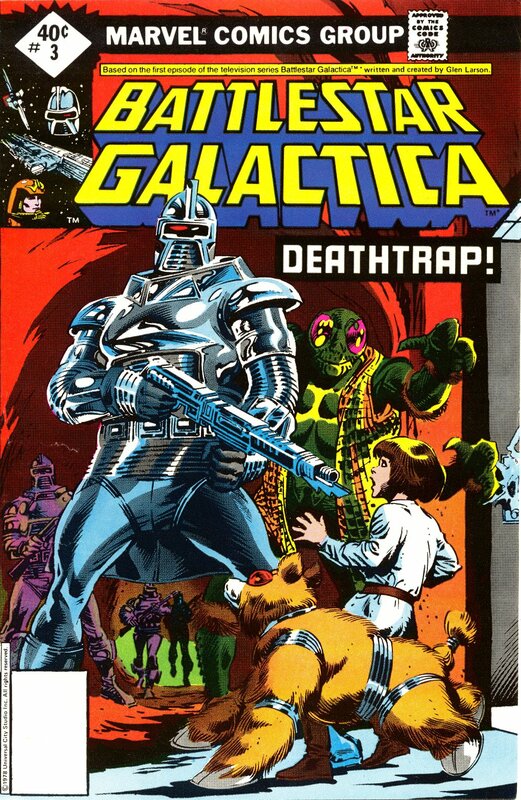 Look out for Death's Head II amongst the assembled heroes and villains. 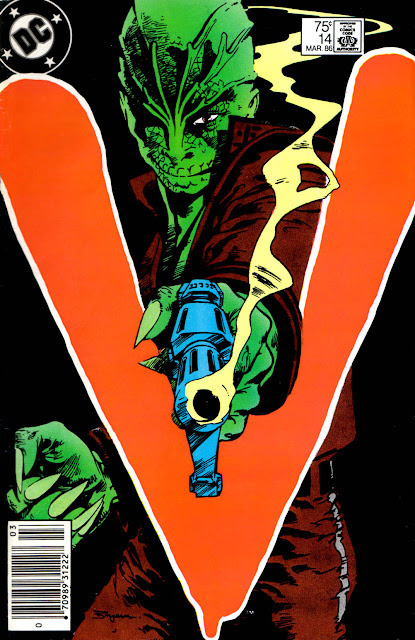 During the Marvel UK boom years of the early 1990s, the Marvel mandarins indulged in a little cosplay and invested in a DEATH'S HEAD II costume for personal appearances. 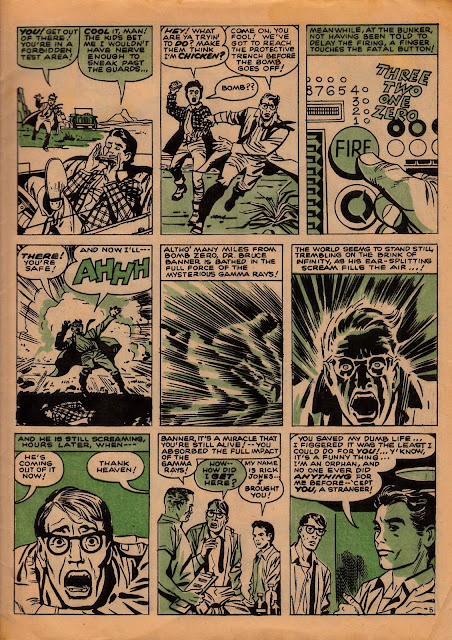 Here are a few stills that appeared in THE EXPLOITS OF SPIDER-MAN. As part of Slow Robot's ongoing salute to the original BATTLESTAR GALACTICA, here are several more videos gathered from that wonderful land of You Tube. 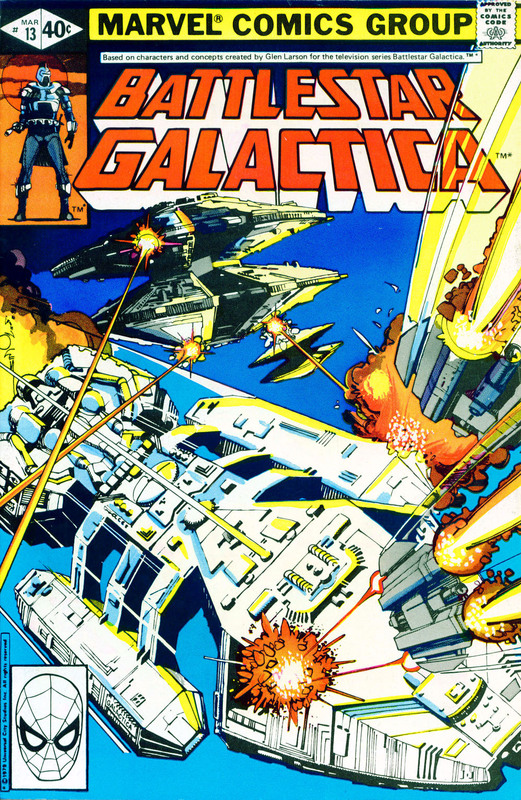 A selection of hitherto unseen storyboards for the opening Cylon attack in Saga of a Star World (aka the BATTLESTAR GALACTICA movie). 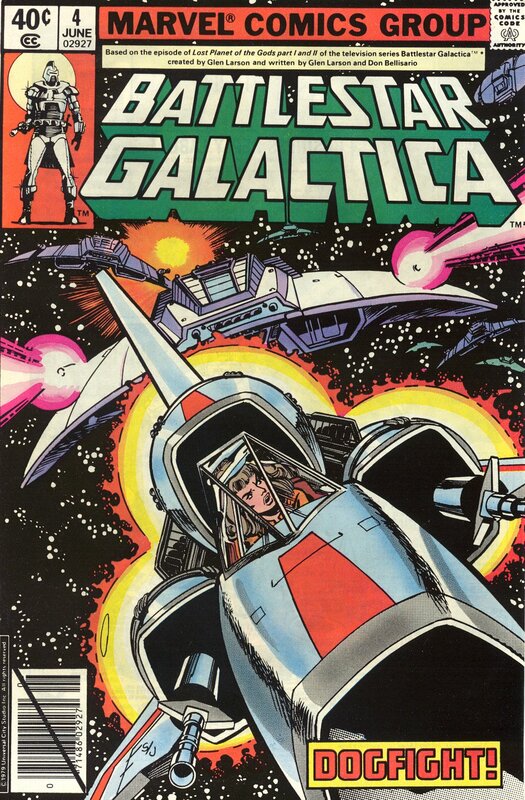 Note that the Galactica, Raider and Vipers are pretty much locked but the Cylon Centurions and Cylon Baseships are still based on earlier pre-production designs. 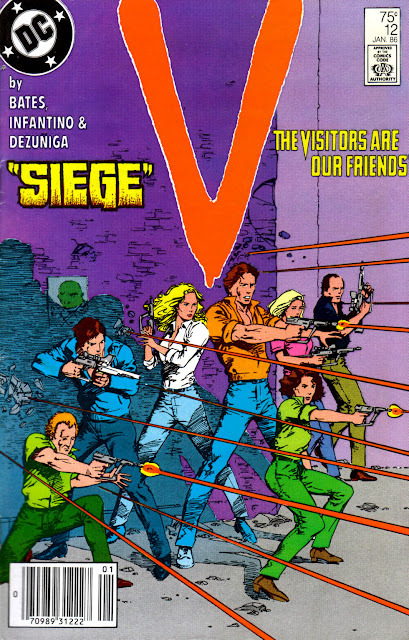 This attraction, which opened shortly after the TV show was cancelled, lived on until the early 1990s. Nice spaceships, shame about the scripts! The famously unexpected success of STAR WARS sent every Hollywood (and a few Italians) scurrying around to see what long-in-development projects could be given a hasty sic-fi sheen. 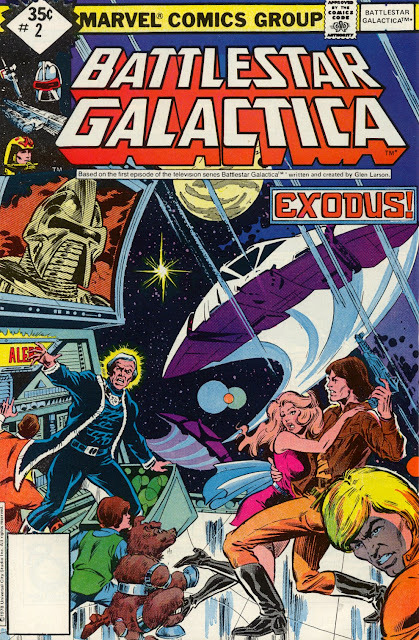 Fortunately for Universal, producer Glen Larson had something called ADAM'S ARK (the last survivors of an about-to-go-boom Earth are whisked into space by a Howard Hughes type) which, with a little bit of work, could be made to look an awful lot like STAR WARS. 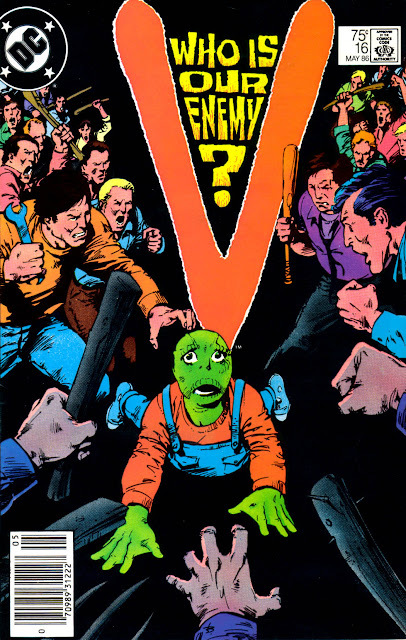 Phew. 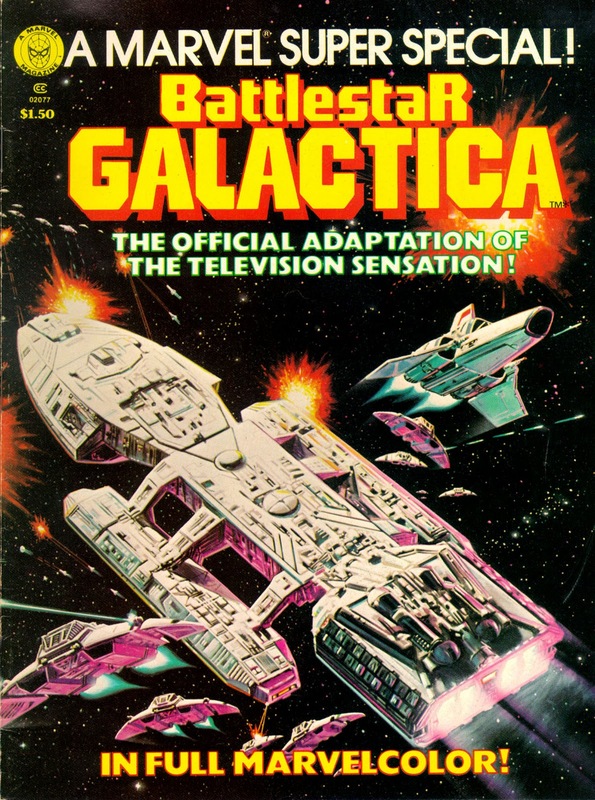 BATTLESTAR GALACTICA arrived with much hype in the Fall of 1978, giving sic-fi fanatics a chance to see a close approximation of STAR WARS, for free, every week. Well done Glen. Universal were spending a fortune on the TV show (the three-hour pilot apparently cashed-in at $12 million + and subsequent episodes, despite being noticeably cheaper, still apparently cost near to $1 million) but cashing in on sneaking out selected episodes as faux feature films in overseas markets and offering shedloads of (frequently sub-standard) merchandise. Unfortunately, broadcaster ABC wasn't getting a piece of the merchandising action and its crack accountants quickly calculated that the hefty price they were paying for the show didn't leave much room for a stellar profit margin. So, after a year and despite none-too-shabby ratings, ABC pulled the plug. They had a change of heart within six months and tried again with the cut-price catastrophe GALACTICA 1980. 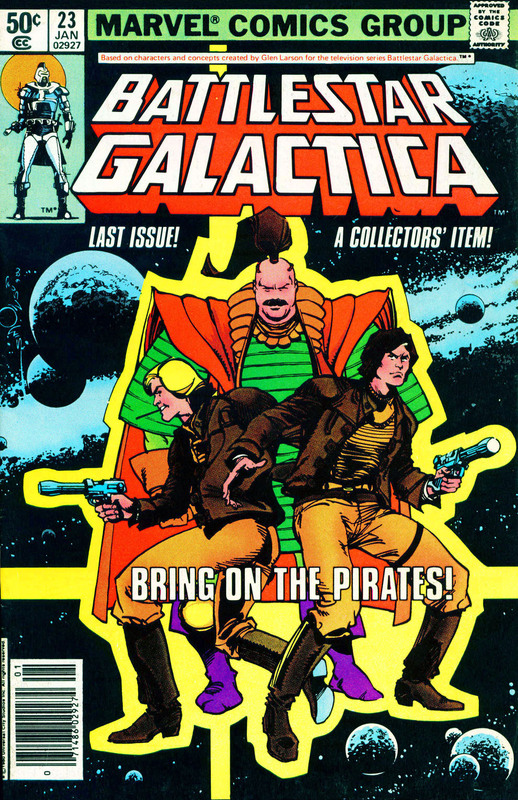 But, we'll get to that. Marvel, flush with their STAR WARS success, were quick to snaffle-up the comic book license. They produced an adaptation of the extended pilot (released theatrically overseas) in the Super Special magazine format. And repackaged the same material in Treasury (tabloid) and paperback formats. Obviously produced while the show was still at the earliest stages of production, the Super Special version includes several inconsistencies compared with the final screen version. 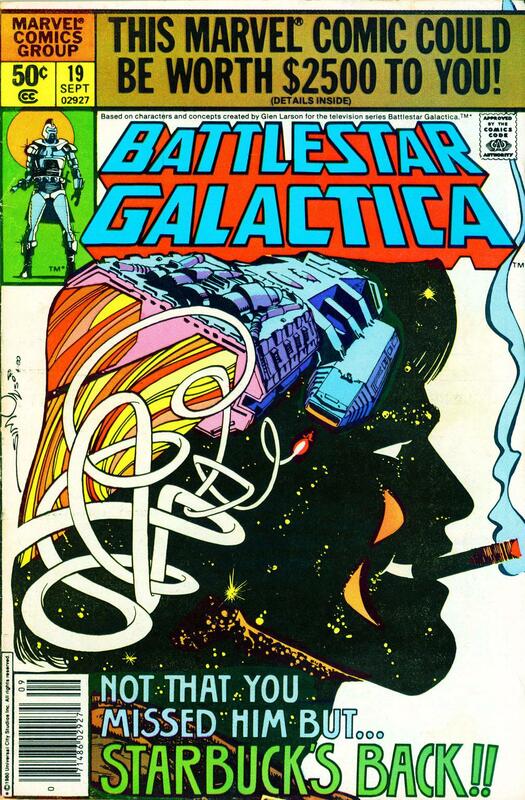 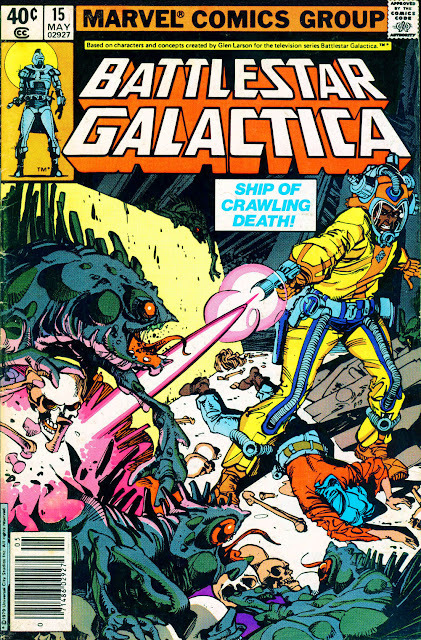 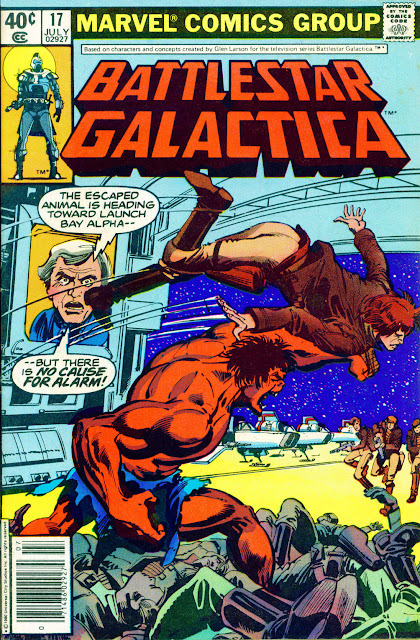 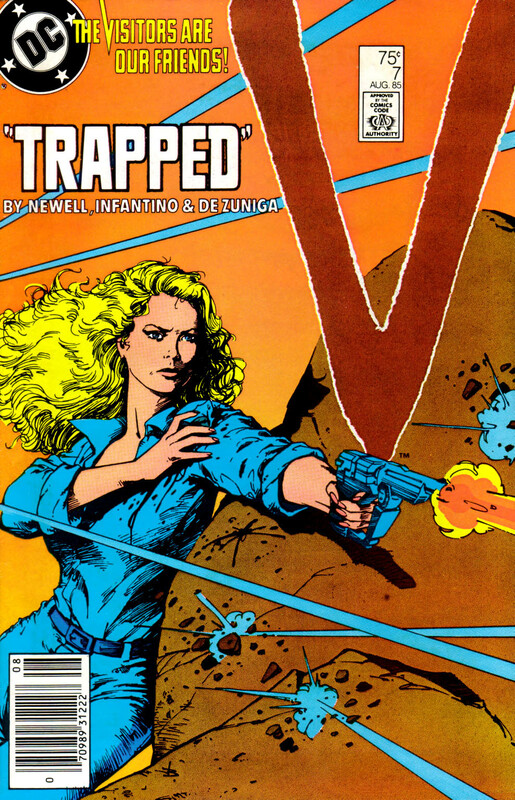 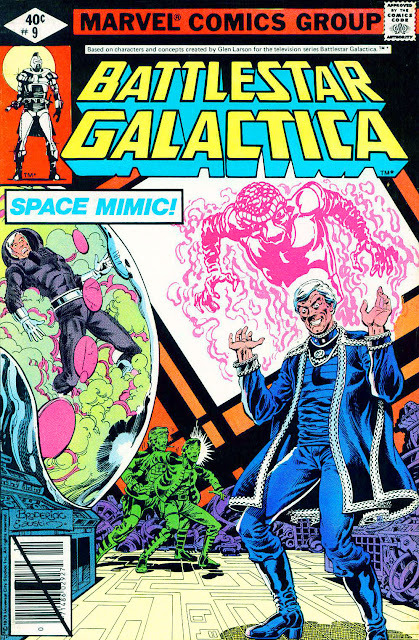 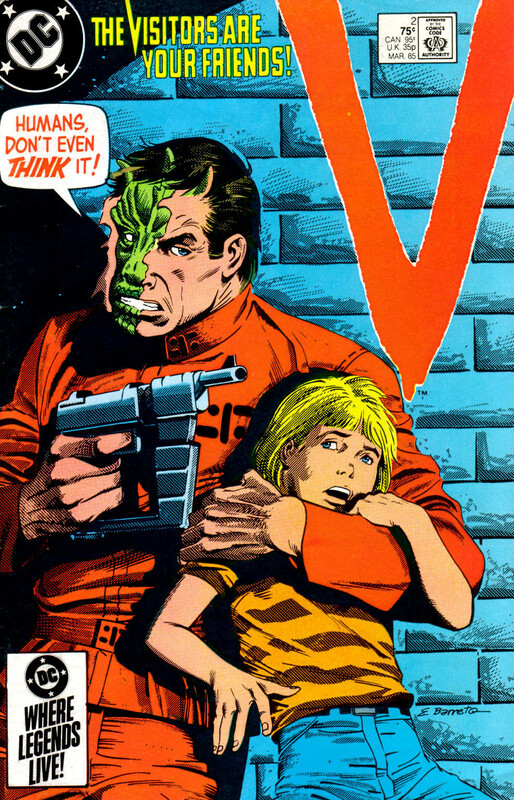 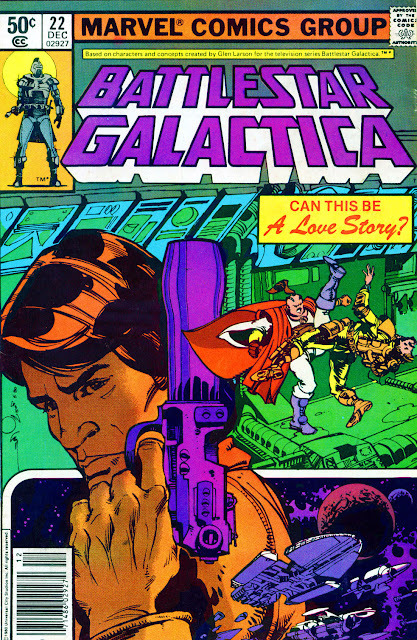 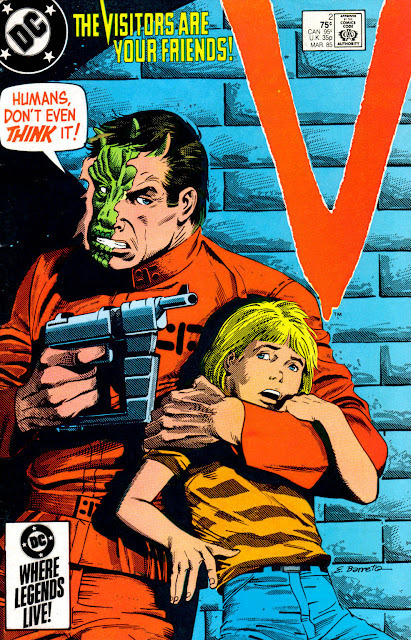 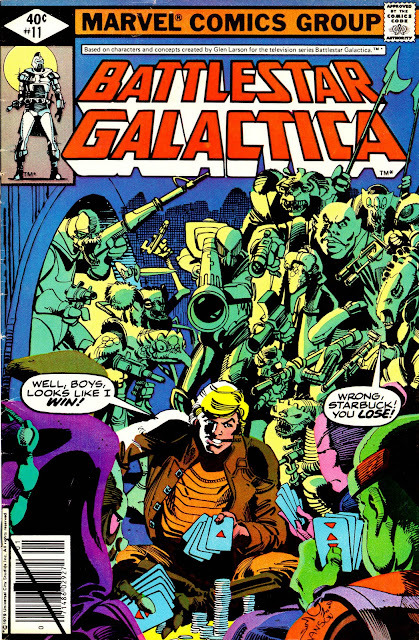 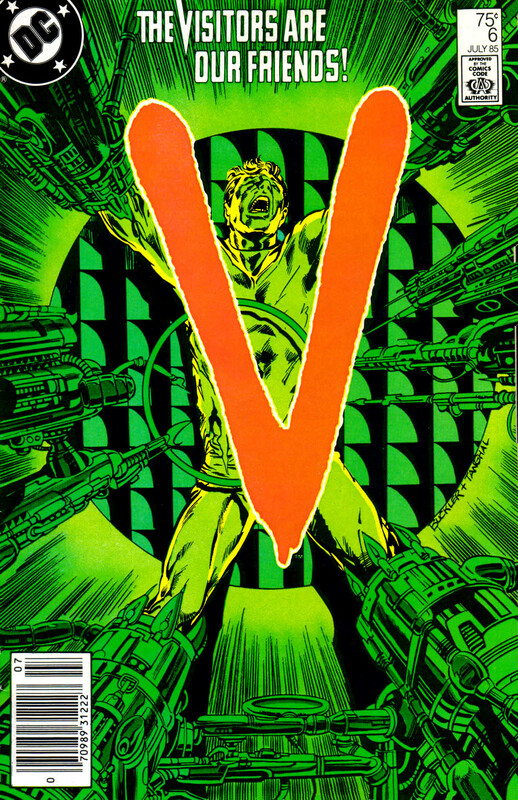 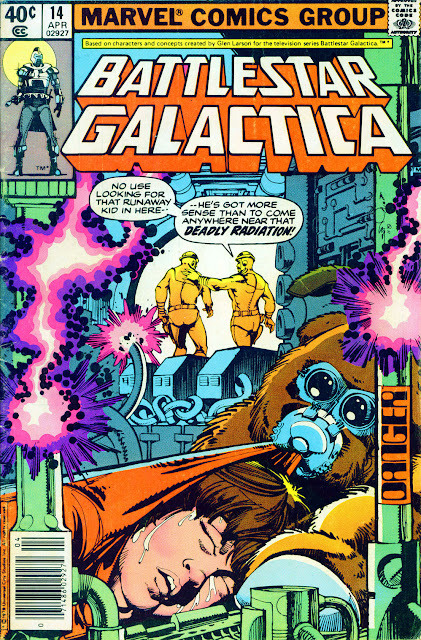 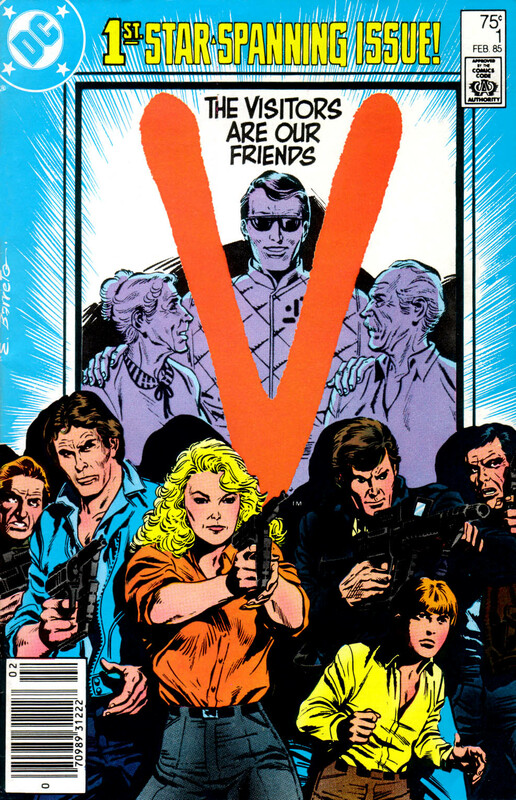 Marvel used the same material to form the basis of the first three issues of their regular Battlestar monthly but less pressing deadlines allowed them to amend and correct the earlier version. 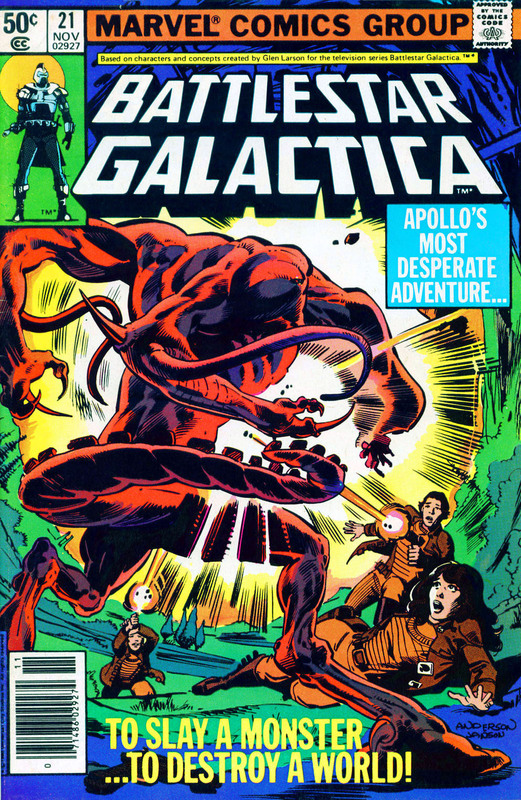 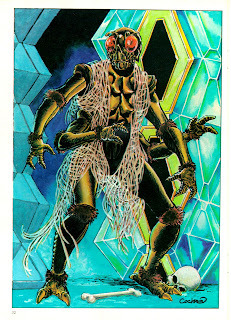 Issue 4 and 5 adapted the TV episodes Lost Planet of the Gods. The first story aired after the pilot (The Gun on Ice Planet Zero was shot first), it was originally intended to be one of the three TV movies (along with the pilot and GOIPZ) before ABC decided to commit to a full series on the strength of the rushes from the first episodes. Marvel's license only covered the first five TV hours (which meant they were unable to incorporate any of the later characters and concepts like the Eastern Alliance), leaving it free to create its own interpretation of the series. 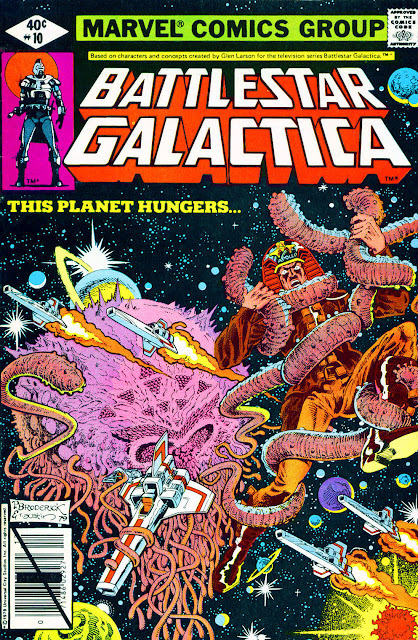 Cue: space vampires, peckish planets, new-fangled flashback machines and space pirates. 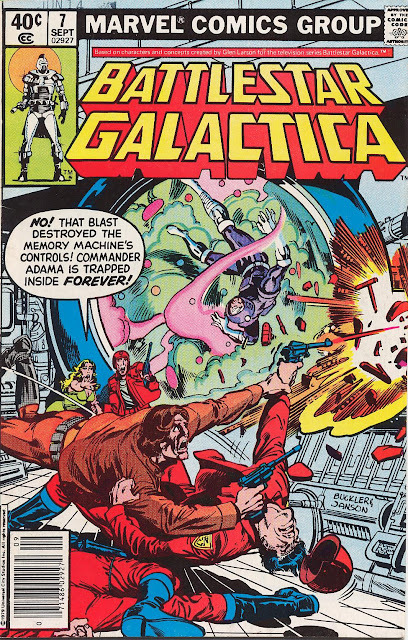 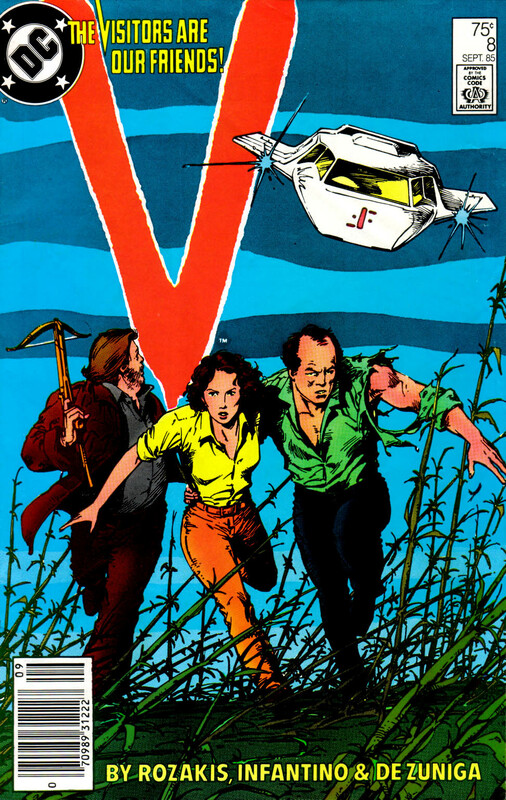 One notable difference to the TV version is that Marvel left Baltar to die in the rubble of Kobol whereas the TV show inexplicably resurrected him, albeit with a limp, the following week. 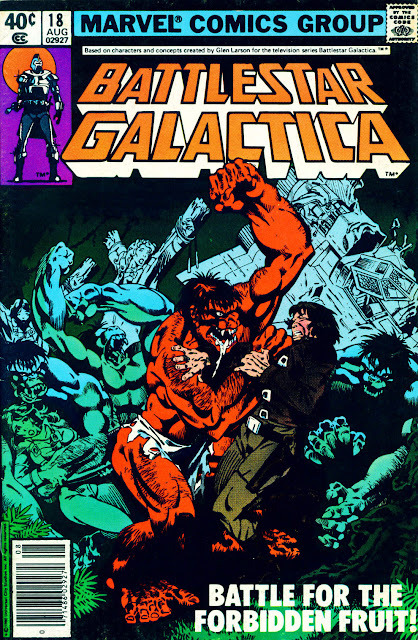 This issue is actually an unused TARZAN: LORD OF THE JUNGLE inventory story left on file after the book was hastily cancelled (29 issues, 1977-1979), reworked to fit Battlestar (with Apollo substituted for Tarzan!). 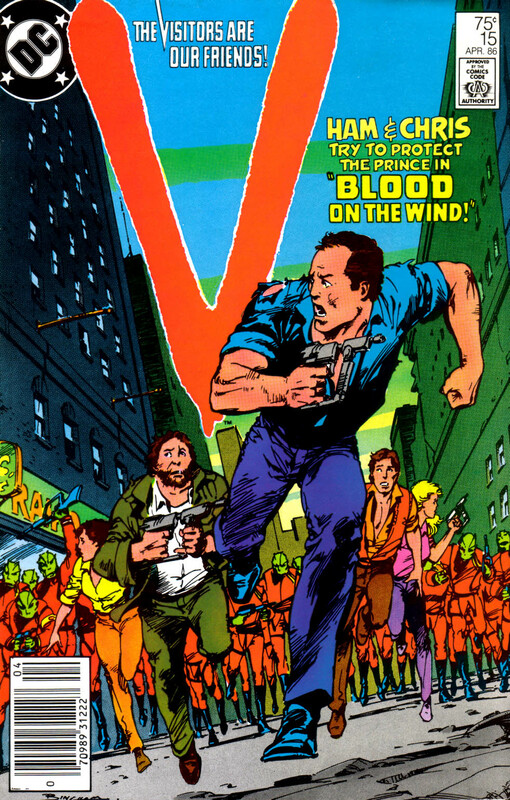 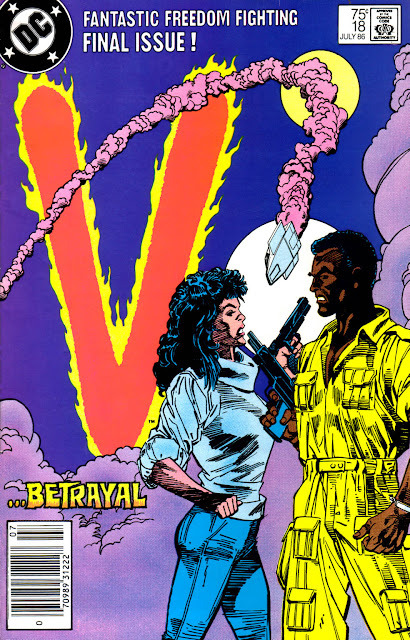 Issue 17 was especially created to lead into the amended strip. 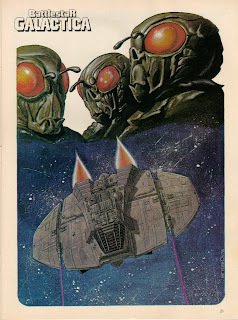 There was no UK edition of the pilot/ movie adaptation but the two-part Lost Planet of the Gods was published in STAR HEROES WINTER SPECIAL 1979 (along with THE MICRONAUTS), almost a year before it appeared on screen (and then only in the London region). 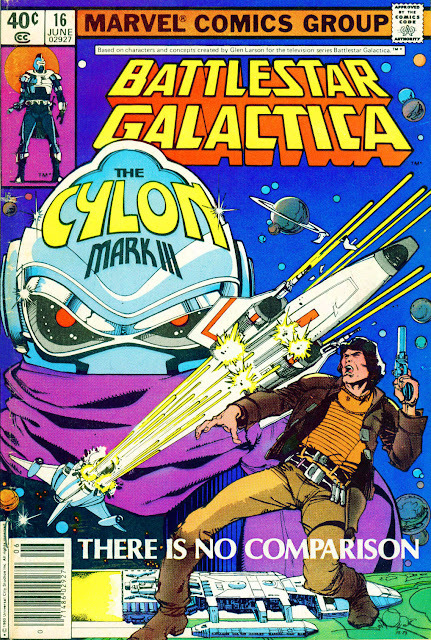 Marvel UK Editor in Chief Dez Skinn had initially planned to run the Battlestar reprints as a back-up strip in STAR WARS WEEKLY (always desperate for suitable material) but Lucasfilm and 20th Century Fox (who were busy suing Battlestar for ripping-off Star Wars) got wind of the plan and swiftly put the kibosh on it. The summer of 1980 saw the launch of Marvel UK's black and white A3 POCKET BOOK range (largely assembled of sixties reprints) including STAR HEROES POCKET BOOK, reprinting (again) The Micronauts and Battlestar beginning with US 5. 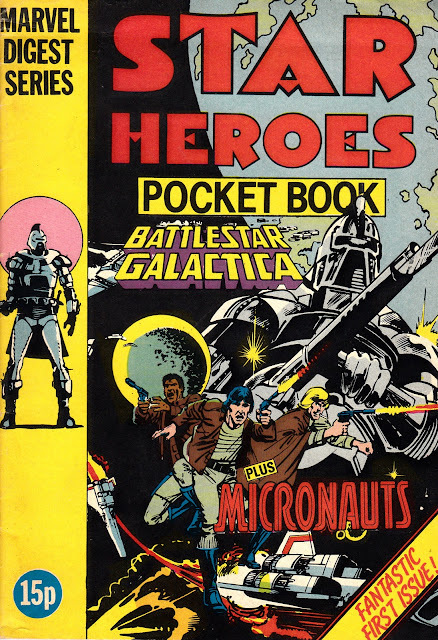 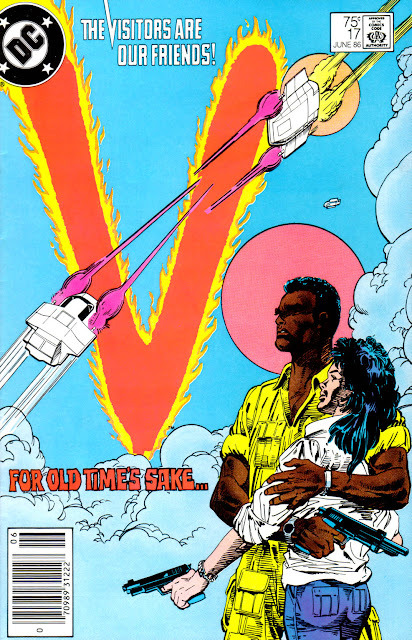 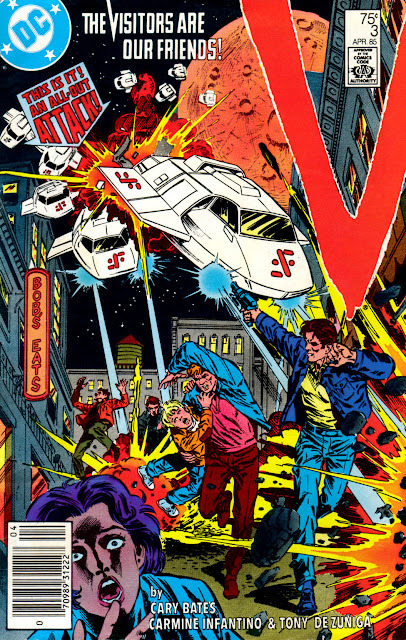 With the Battlestar reprints exhausted, and The Micronauts required for the new weekly FUTURE TENSE, Star Heroes morphed into X-MEN POCKET BOOK after a year. 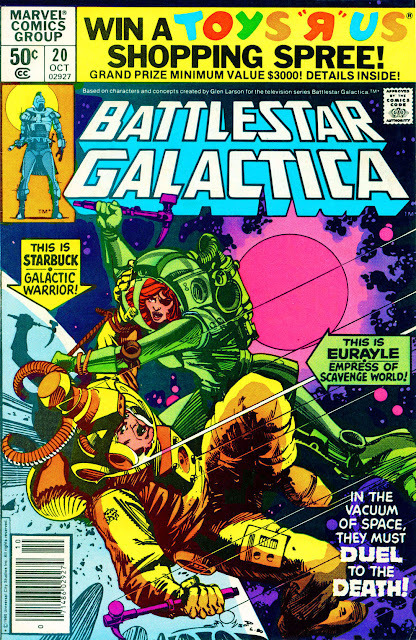 Selected Marvel Battlestar strips were reprinted in two Titan Books trade paperbacks: SAGA OF A STAR WORLD and THE MEMORY MACHINE. 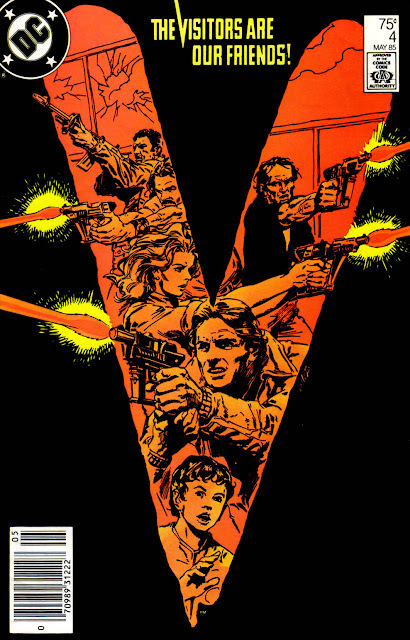 The series didn't earn a network slot and different ITV regions aired the show at very different times (or even not at all). 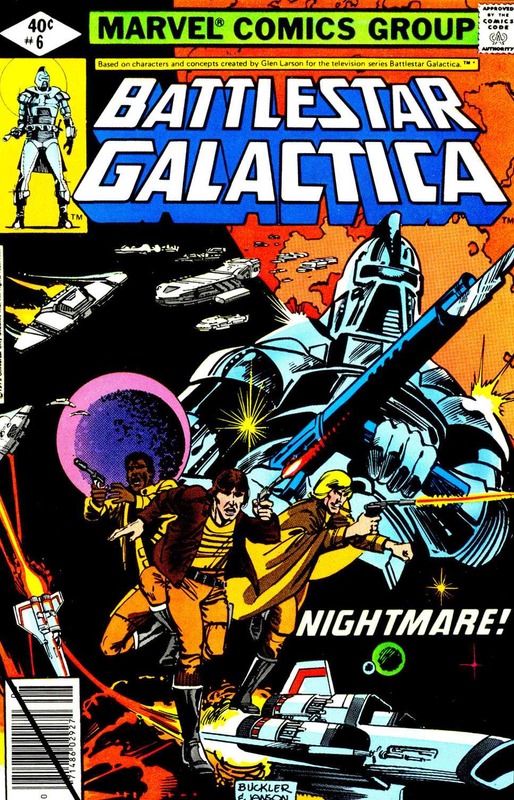 Thames aired the pilot, The Living Legend and Fire in Space although other regions subsequently omitted them because they formed the first two theatrical releases (BATTLESTAR GALACTICA and MISSION GALACTICA: THE CYLON ATTACK). 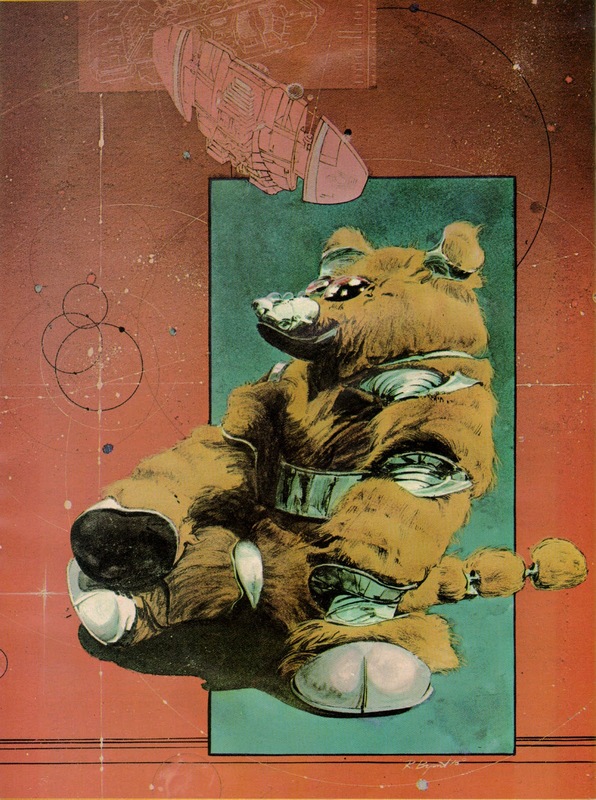 In the early 1980s, US TV bigwigs had strict rules about using animation to promote toys. 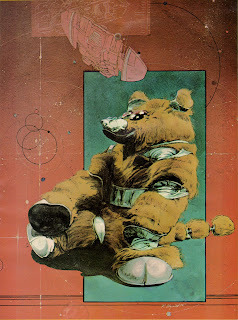 The boffins were concerned that young consumers would be misled into believing the toys were more impressive than they really were by the cunning use of cartoons. 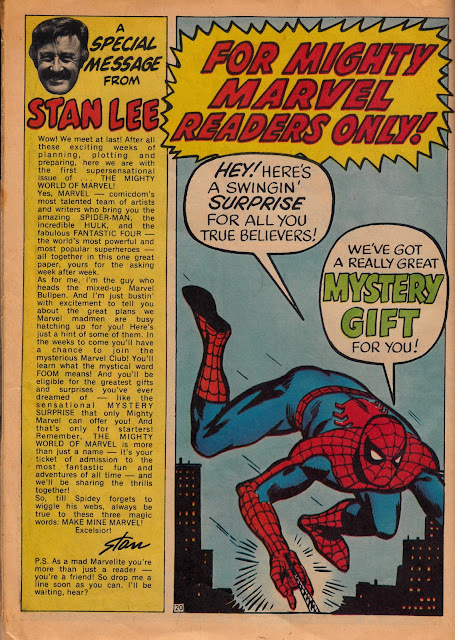 Hasbro's Marketing brains-trust spotted a devious way to circumvent the rules: bankroll TV spots for Marvel's G.I. 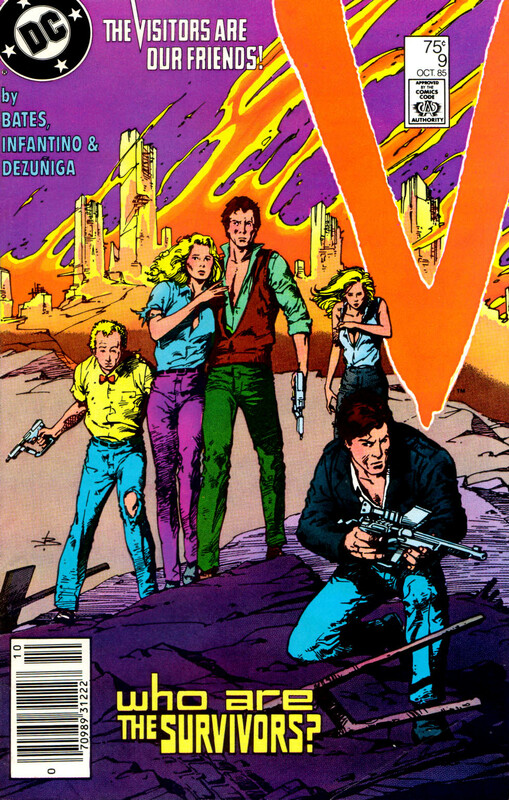 JOE comics which, conveniently, just happened to feature the very same toys that Hasbro wanted to promote. 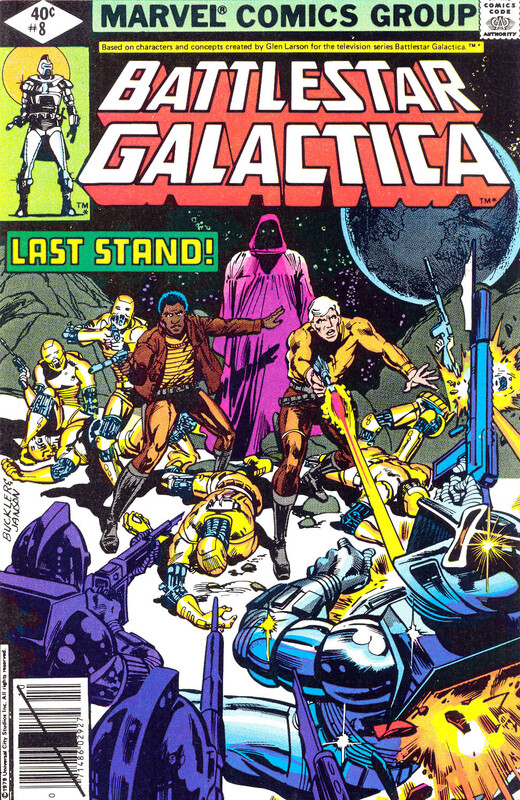 But - because the commercials were for the comics and most definitely NOT the toys - the rules didn't apply. 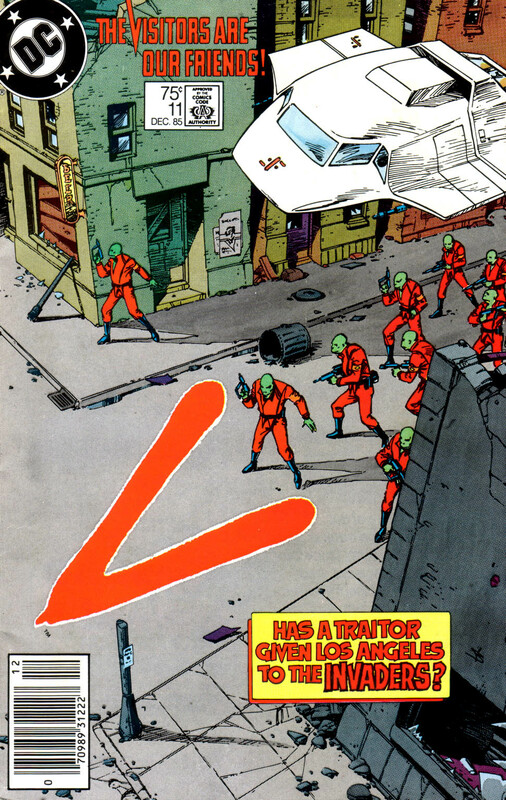 As sneaky as Serpentor! 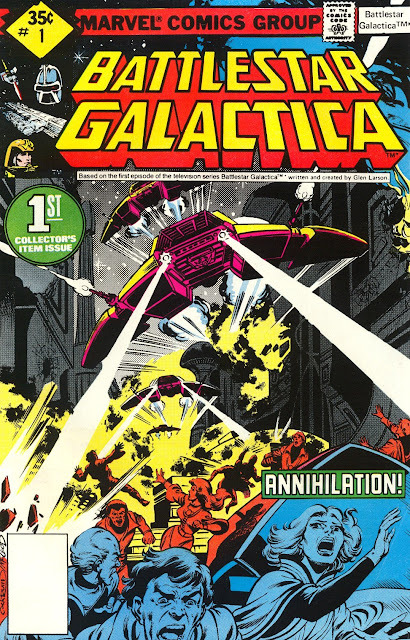 And it gave Marvel a best-seller (on newsstands, in grocery stores and by subscription although it failed to make the same impact in comic book stores)! 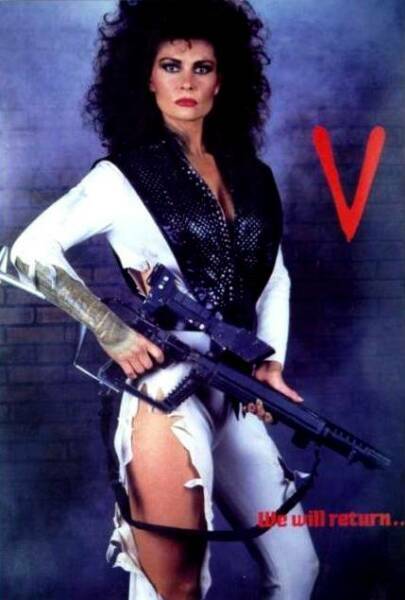 It's NOT on the DVD release! 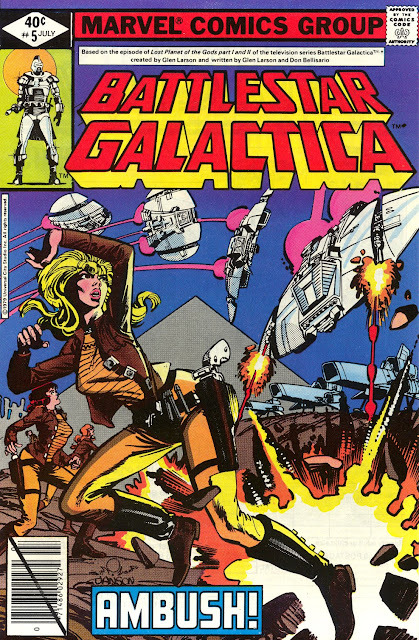 The official for-the-eyes-of-the-crew-only BATTLESTAR GALACTICA BLOOPER REEL.